Acts 2:42 Small Groups meet Wednesday nights from 6:30-8:00 pm for seven weeks. Small groups build relationships necessary for personal and spiritual growth. Just as the early Christians were teaching and learning “from house to house,” we should respond in our walk with Christ in small group house meetings. 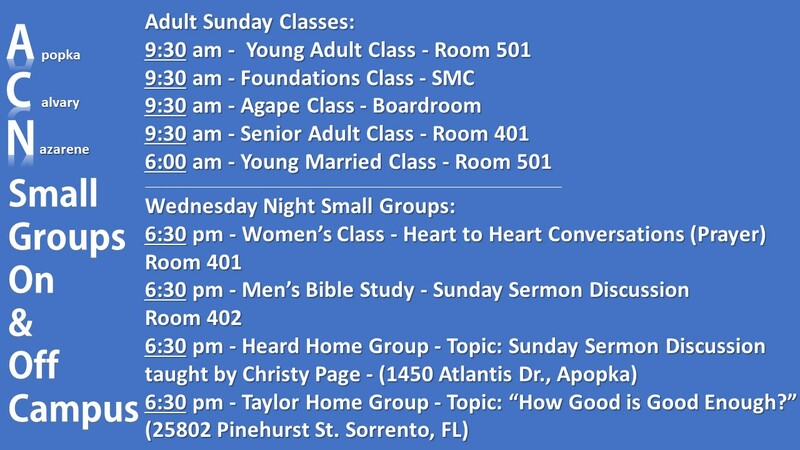 Call the church office at 407-889-2148 for more information, directions and to join an Acts 2:42 Small Group today. Children and Youth meet at ACN each Wednesday at 6:30 pm for their worship services. Call 407-889-2148 or just drop in – you are always welcome!